Technology is changing everything, and the world of kitchens is no different. The precious space that we all love, the one in which we cook, eat, drink and live, is changing alongside everything else. This has seen the rise of kitchen gadgets become particularly prominent over recent years, with the kitchen becoming the modern hub of activity for any home. Below are just a few of the latest and greatest kitchen gadgets on the market. Make any one of these a part of your own kitchen, and you’ll be taking your first steps into a larger kitchen world. The future is here. Looking to light up your kitchen space whilst creating a unique atmosphere? These flexible LED strip lights achieve exactly that. They’re also colour changing, enabling you to add a further splash of your colour of choice to the best room in the house. With a choice of 3 colours and 7 different effects, these dynamic lights are easy applied using an adhesive strip. This also includes a special 3-in-1 remote that gives you the power to control your coloured lights remotely, whilst also linking other lights and controlling them simultaneously. These are particularly effective for those with modern or contemporary kitchen designs, as the sleek and futuristic look of coloured LED strips sits well with their stylistic points. If you do a lot of cooking, then a great cooker hood is a must. If this applies to you, then get ready for the kitchen addition of your dreams. The Neff Cooker Hood is a state-of-the-art gadget complete with sleek and functional touchscreen, app controls and countless other features to revolutionise your everyday cooking experience. The classy black glass interface includes touch commands to action incredible features such as various different speed settings, noise reduction, powerboost, air fresh and even a post-burning function for those little mistakes we all make from time to time. 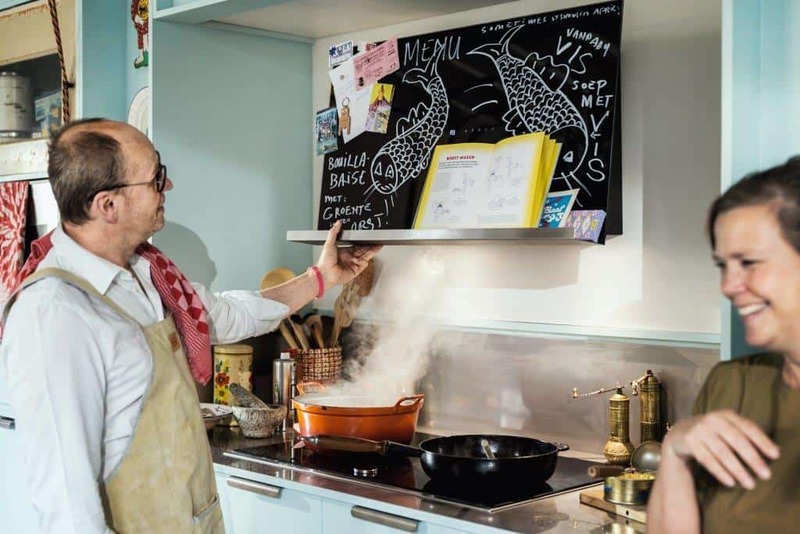 The Neff Cooker Hood is powered by a silent and energy saving engine, with an air quality sensor to really maximise your enjoyment and wellbeing in the kitchen. All of this is encased in an aesthetically stunning exterior akin to the highest quality flat screen TVs. Push your kitchen forwards into the next frontier of home appliances with the Neff Cooker Hood. You’ll never look back. This is one of those kitchen gadgets that will have you wondering how you ever manged without it. Waiting for a kettle to boil can be a pain, and boiling water in a pan is even worse. 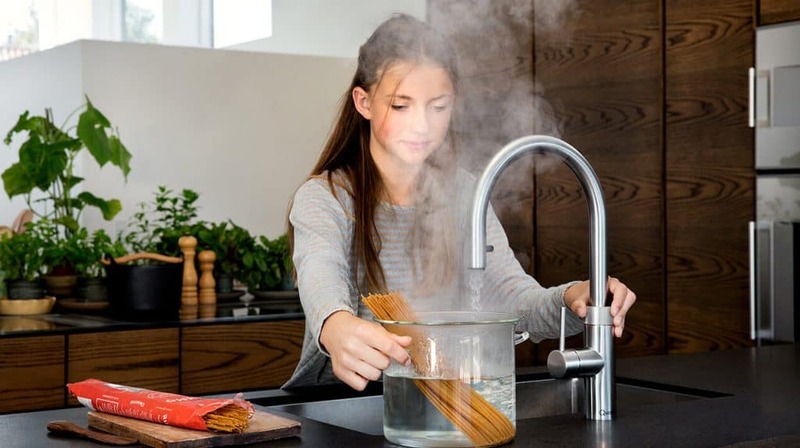 The Quooker Tap range negates such issues, providing quality boiling water on demand. That’s right, you’ll have boiling water quite literally on tap. The hot and cold models are supremely safe in their shifting temperatures, and the hot-only Quooker taps will sit as a separate unit to your standard tap, reducing any risk of accidents. 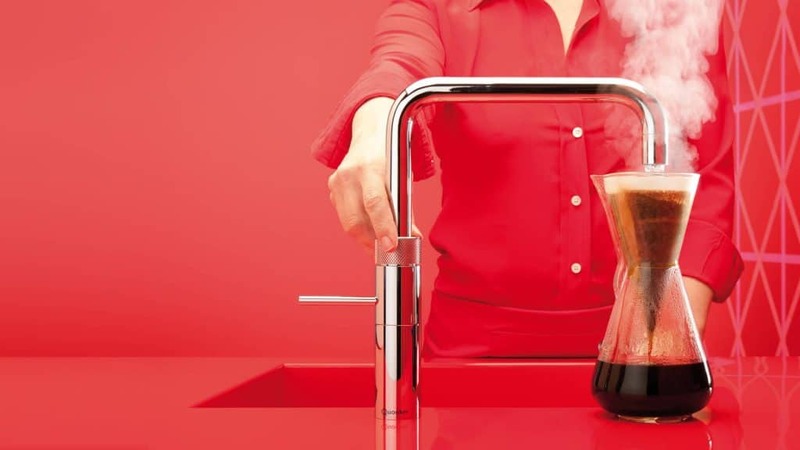 Go for a Quooker boiling water tap and having a brew will never be the same again. Recent trends have seen the kitchen become more than just a cooking area. Now more than ever, kitchens are a living space in their own right, often providing comfort and a social setting as much as meal preparation. Following such a shift, more and more people are opting to incorporate smart TVs into their kitchens. Whether it’s to watch your favourite TV show whilst making (or eating!) breakfast, cooking shows as you prepare for tea time, or even a film during or after an evening meal with the family, smart TVs in the kitchen bring benefits none of us could have dreamed of in the past. Even the rise of voice technology is having an impact on kitchens. Through specific fridge/freezer or oven models and other adjacent appliances or gadgets, voice activated systems such as Alexa are starting to find their way into kitchens across the country. This is seeing people utilise the software to complete important kitchen-based tasks like listening to music whilst cooking, making shopping lists, and even ordering the shopping itself. Systems like Alexa (and its incredibly popular device, Amazon Echo) are part of a larger move towards the ‘smart home’, in which all devices across every room are connected and controlled remotely. As it is the true heart of the home, the kitchen will continue to play a key role in the development of this particular trend. Some kitchen appliances are now even utilising camera technology. Fridges which enable you to remotely check on their contents as you wonder around the supermarket could change the way we do our food shopping indefinitely. Similarly, fridge/freezers that have cameras to detect when certain spaces are empty and inform you to fill them are starting to emerge. Make no mistake, the future of kitchens is very exciting. When people think ‘gadgets’, their minds may automatically jump to phones, computers and cars. The truth is that no part of modern life is more open to the benefits of technology than our kitchens, and that is a truth we will continue to see coming to the fore in 2019 with the above developments. If you haven’t already, acquire one of these gadgets and become a part of the kitchen revolution. If you’re interested in getting your next kitchen with us and including one of the above gadgets as part of your package, feel free to give us a call on 01706 826 557. Alternatively, you can drop us an email at info@ramsbottomkitchens.co.uk.